In all the three years of this food blogging business, the cuisine whose restaurants I have reviewed and have closed the most is Vietnamese, numbering 3, not counting those I didn’t write about. Furthermore, recently, one of favorite places located near me folded up suddenly, which left a significant hole in my gastronomic palette. Consequently, a mission was set in me to find a worthy replacement, and a worthwhile place appeared unexpectedly in a most improbable place. I Love Pho is located at the back of an International grocery store in the heart of Laurel, MD. The space has seen one eatery after another come and go, and the opening of this food establishment piqued my curiosity. Initially, I was a bit nonplussed by their offering in their early days. However, there was a change of chef a few weeks later, and their dishes were starting to raise my eyebrows. 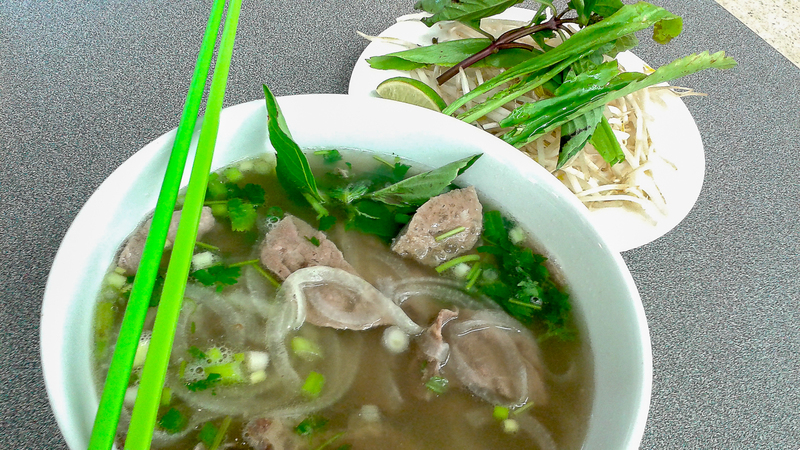 After paying it a number of visits to sample the various dishes, I felt that I Love Pho was worth a write-up. 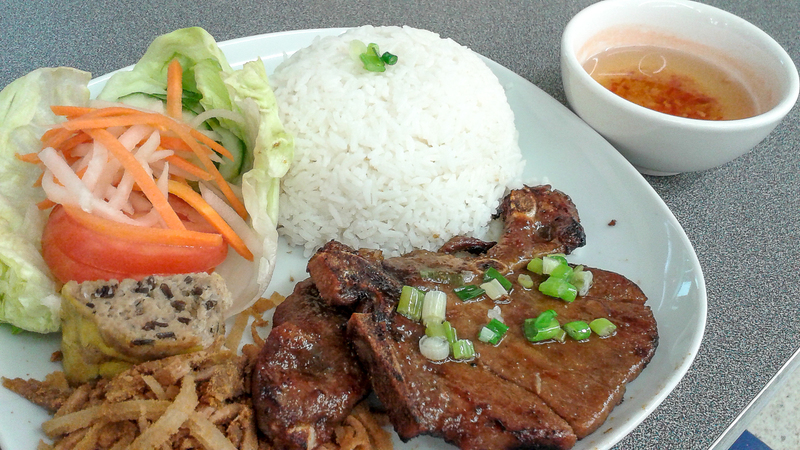 This eatery offers only two appetizers, and both are the usual Vietnamese standards. 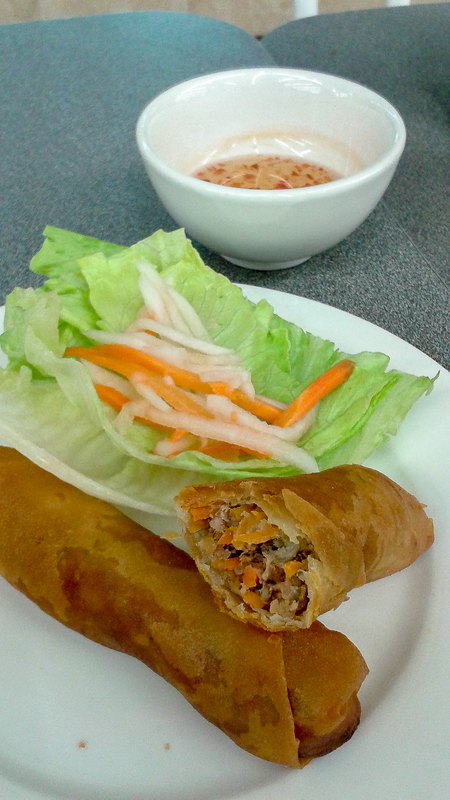 Cha Gio are Vietnamese spring rolls that I love from this cuisine. Their rendition here captured my attention from the first bite. The rolls were perfectly deep-fried, nearly greaseless to the touch. One bite into the roll revealed a very savory stuffing of minced pork, carrot, and shrimp, well-seasoned with spices and white pepper, and a slight touch of bounce from the bean noodle and wood fungus. 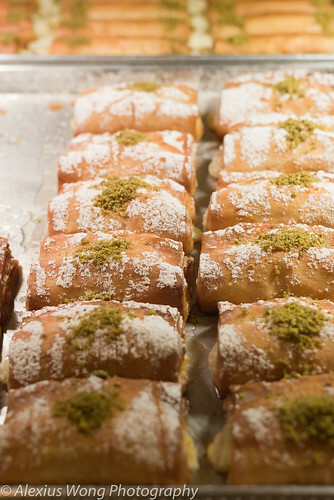 But it is this same mixture that takes these rolls to another level as if having gone through a process of transubstantiation, tasting savory and beckoning the eater for more bites. The dipping sauce was also revelatory with its decent fish sauce, a good hit of lime juice, a hint of garlic, some crushed chili for some heat, and enough sugar to “round off” the strong flavors, making it worthy to sip like an elixir. The other standard opener is Goi Cuon or Summer Roll. During my visits, they were made a la minute which made them stand out from other establishments. 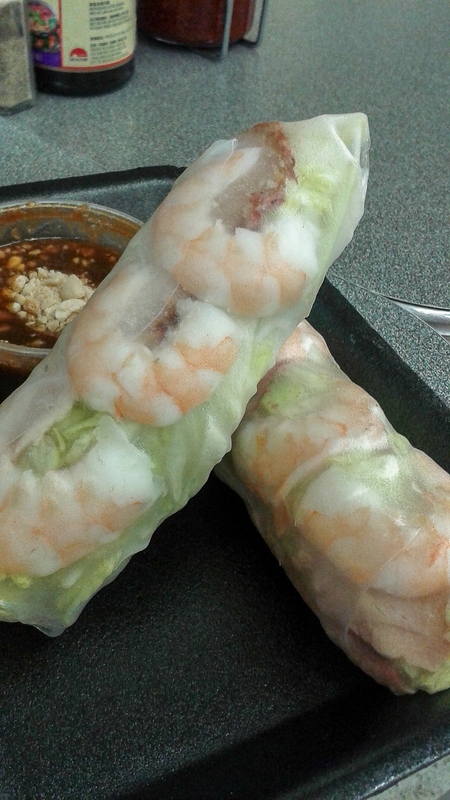 The rice paper was supple and not chalky at all (due to refrigeration), wrapping the usual suspects of shrimp, pork, basil, and rice stick noodles. I also appreciated the shrimp that was not overcooked and the pieces of pork that were seasoned with enough salt, unlike the bland meat found in other places. The dipping sauce, tasting house-made, was not just only sweet from the Hoisin, but salty enough to balance out the latter flavor, making it stand apart from other versions which tend to be lacking in the salt department. Again, another sauce that is finger-licking-good here. Unfortunately, my last order was refrigerated, resulting in the brittle and chalky qualities in these bites. One thing that I appreciate in this place is the serving of a Vietnamese favorite, Banh Mi, which can be hard to come by. 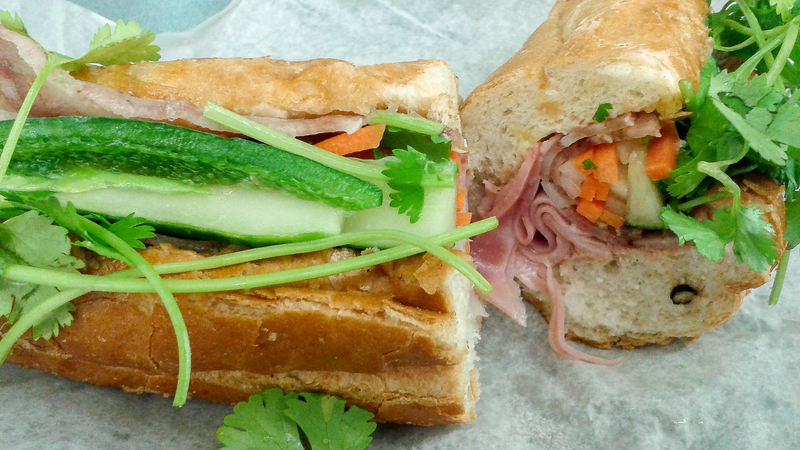 The sandwich comes with an opened French baguette that was crusty and fairly spongy inside, stuffed with ham, Vietnamese salami, some daikon and carrot pickles, crunchy cucumber, crispy jalapeño, and fragrant cilantro. What adds some interest in these stuffed rolls is the salami that is studded with piquant peppercorns and made fragrant with some five-spice powder. Furthermore, the bread has been slathered with some rich paté on one side and the other garlic butter – yes, you read that right. The result is a bite that is completely irresistible, the sum of all the disparate elements that seem to fit in just right in that crusty bun. At $5 each, this is a damn good sandwich. Another room temperature dish is Pork Bun Salad. The deconstructed bowl arrived with the various ingredients hugging their separate territories: Grilled Pork, pickles, basil leaves, cucumber, and crushed peanuts, all sitting on a mound of bouncy rice stick noodles. The meat was perfectly cooked and tasting equally well seasoned with notes of fish sauce saltiness and some sugar sweet. That amazing fish sauce dipping sauce is served to be poured on the mixture that binds all the bowl partners together. This is another perfect summer dish in my books. 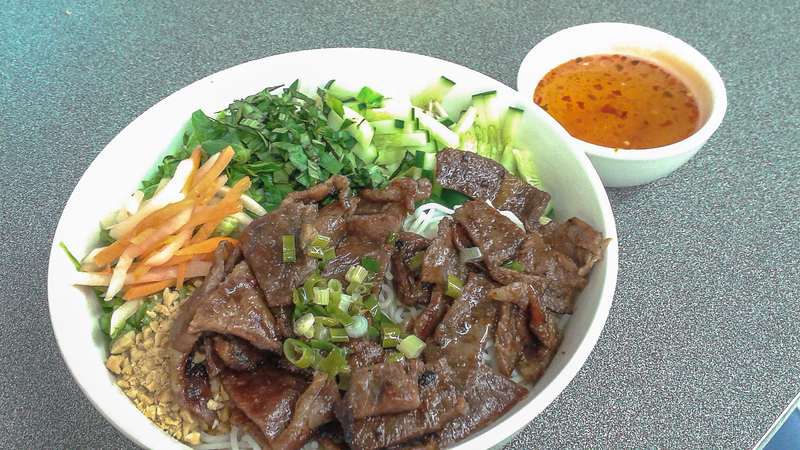 The ultimate litmus test in a Vietnamese place is its Beef Pho Noodles. Having said that I was not too wowed by the previous chef’s cooking, I was immediately impressed by this bowl with the change of guard. The secret to a good bowl of noddle is always in the broth, and this version grabbed my attention with the first sip. The fairly clear soup tasted complex from beef bones, interesting from the use of wood spices without shouting out their individual characteristics, and slightly dark and sweet from burnt whole onions. The co-stars in the bowl were equally impressive with the meat balls, thinly sliced beef, the bouncy Pho noodles, and the different garnishing which included the rarely served long leaf called Culantro in the Caribbean. After ingesting this revised recipe for the first time, I knew something was up in the back kitchen, and I did return indeed to try the other dishes. 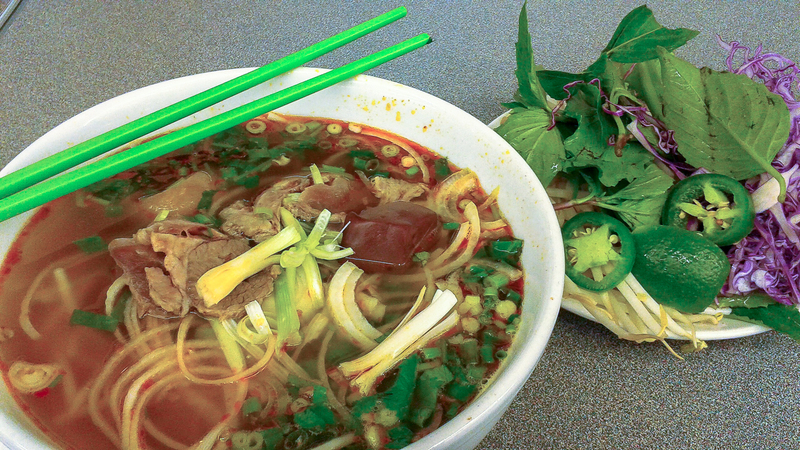 The second litmus, in my mind, is another noodle soup, Bun Bo Hue, if it is offered at all in a Vietnamese joint. This is a spicy fragrant beef noodle soup with which the secret also lies in the broth like the above. The first sip of it again raised my eyebrows; it was complex with the lemongrass citrus fragrant hit, spicy with a slight throat-burning chili heat, and savory from the use of bones and the slightly funky shrimp paste in the making of its broth. Furthermore, some of the edible ingredients pointed towards a level of authenticity, notably blood cake and slices of tendon and pig’s feet. Not only I cannot get enough of this wonderful bowl, but also a friend who refuses to drink water as to not dilute the soup that he would devour until its last drop. I guess that is a testament to its oh-so-goodness. Not all noodle dishes served here are the soup form. 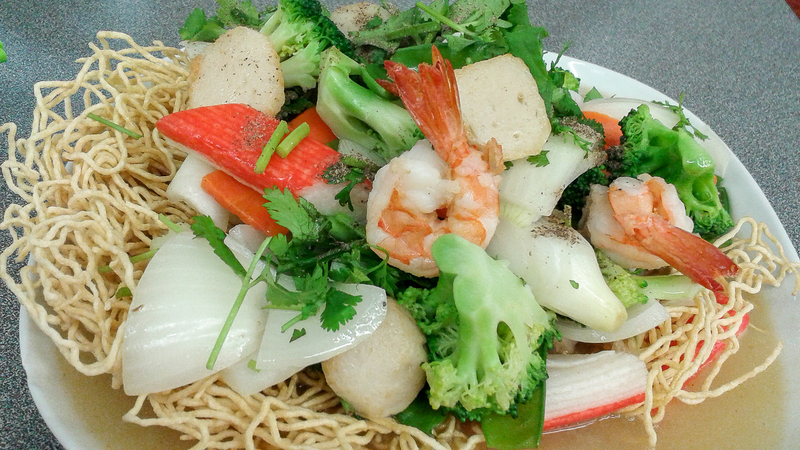 Tucked in the menu, and not on the display board, is Seafood Crispy Noodle. The first time I ordered this, they had forgotten the order, and after reminding them, the result that landed on my table was a sub par rushed job. However, I gave it another try. The second time around, it met my expectations. The noodles were perfectly crispy and cooked in-house, judging by the loud WHOOSH in the kitchen. The topping was a very tasty and savory mixture of seafood and vegetables: fish ball, perfectly cooked shrimp, squid (a bit overcooked the second time), faux crab (didn’t care for that) and a melange of slightly crispy but cooked vegetables. It was the sauce that not only tasted perfectly seasoned and savory, but it was more than enough liquid to soften the noodles with its flavors. I’m glad I give this dish another chance, making it high on my order list. 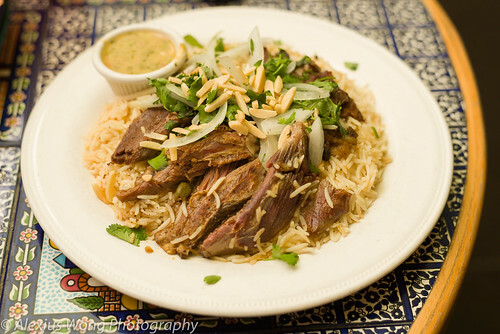 There are a couple of grilled meat dishes worth mentioning. The first is Grilled Chicken. Pieces of well-marinated chicken thigh (not breast, whew) have been grilled until the tips are slightly charred and crispy. 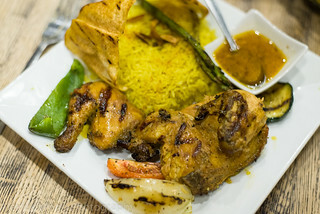 What makes each bite sing in the mouth is the long marination that exuded fragrant lemongrass, salty fish sauce, a hint of garlic, and some sweetness. The salad with pickles and some rice were the perfect foil to these rich tasting bites. Usually not part of the meal, I always request a bowl of that so-good Pho soup to go with the meal, which they are happy to oblige me. With all these well done components, this is truly a satisfactory dinner worth ordering repeatedly. 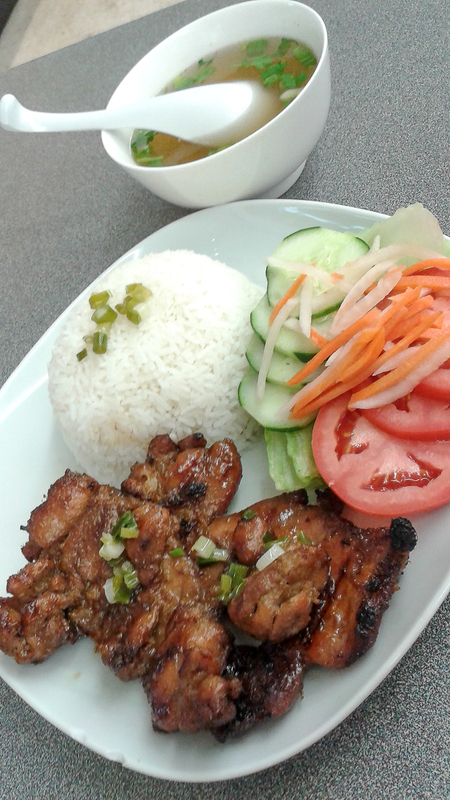 The other grilled meat dish is Grilled Pork Chop. Again, pieces of pork chop have been marinated and pan-fried. The meat was slightly salty from fish sauce and sweet at the same time, while a dose of softened green onions added slight sweet pungency to these bites. However, the plate partners were equal heavy weights on the plate. The slice of meat loaf was very savory with a slight bounce from the use of wood fungus, as well as the pig skin salad that belied its nature with its slight smokiness and tasty allure. What makes this dish successful is the equal attention given to all the elements on the plate. A couple of stews round-up this review. 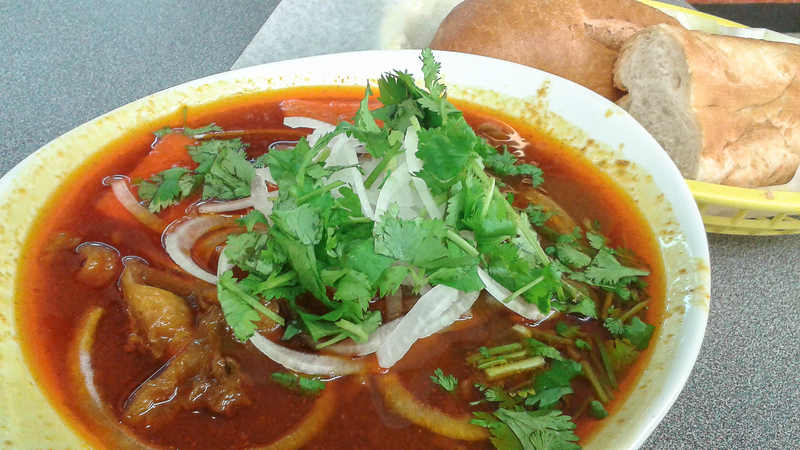 Bo Kho is a beef stew with pieces of carrot. Again, one sip of the broth pointed towards a set of knowledgeable and expert hands. It was perfumed with some lemongrass, sweetened with some tomato and the carrot pieces, spiced with some star-anise, and made savory by the pieces of quality beef that just fell apart in the mouth. A side of crusty baguette was the perfect vehicle to sop up every drop of this wonderful sauce. An alternative serving is with noodles, but I prefer the bread with these tasty meaty bites. 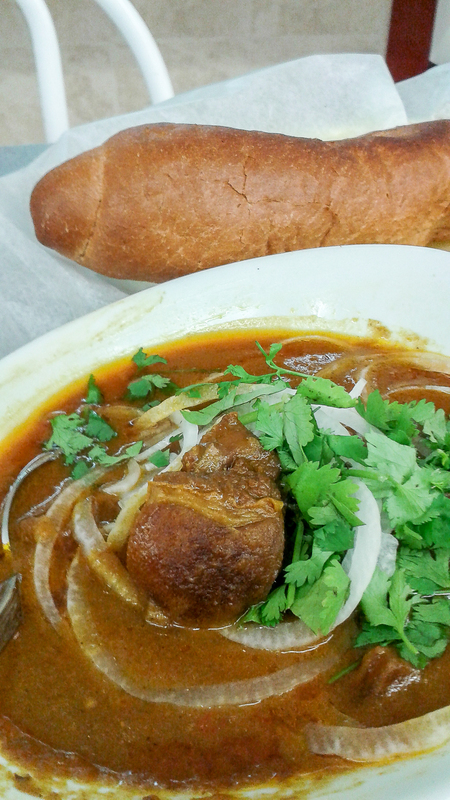 The other stew, and final dish, is Cari De, Goat Curry. This dish was not what I expected at all. Pieces of goat meat with the skin intact were coated in a thick curry sauce, more viscous than the usual Vietnamese curry. Furthermore, it was slightly sweet and it had a hint of acid (confirmed by the chef) with more spice fragrance than the usual renditions, tasting a step above Japanese curry but not the Madras kind. I started to appreciate the rather complex curry sauce as well as the meat whose mild-tasting skin I eventually got used to. Again, the baguette bread was the perfect accompaniment for the dish, instead of the noodles. The low customer presence in this eatery made me wonder if I was off my game by raving about this small unassuming place, like some kind of crazy lonewolf. Checking online reviews of it, my praises for it were echoed by both novices and cognoscentis of the cuisine. I don’t know how long this establishment will last in this spot, but I hope more people will discover it and start to patronize this hidden treasure, albeit in the back of a supermarket. No doubt, all this was said for my own selfish benefit and hungry stomach. This is a busy time of year for me with various events going on at school and me dealing with restless youngin’s who are ready to run out of the building like bats out of hell, while we keep their unbridled energy hostage within the four walls. I have been meaning to write this blog a few weeks ago after paying an Argentine restaurant a few visits upon a friend’s recommendation as the result of his attending a wedding luncheon there recently. Well, this blog posting is well overdue. 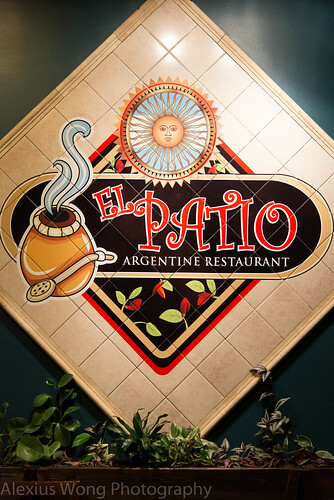 El Patio is located in Loehmanns Plaza in busy Rockville, MD, sandwiched between other businesses, and it can be easily missed due to its narrow storefront. This suburban city has been on my radar as of late due to work-related meetings in that area, and I’m discovering wonderful gastronomic surprises in this part of town with its rich variety of immigrant populations, resulting in eating establishments opened to cater to them. After locating the restaurant, we walked into a rather shotgun space that exuded a sense of comforting welcome. 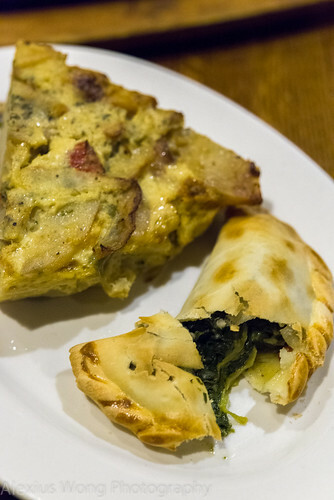 The recommender had mentioned that he was very impressed by the Empanadas here, and I knew that I had to sink my teeth into these appetizers as my meal-opener. 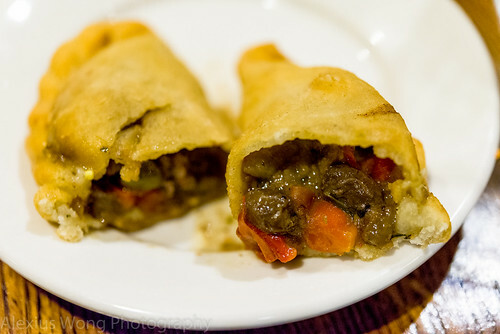 The first order was the “top seller”, Empanada Tucumama, which comprised of beef, olives, tomato and raisins. One bite into it confirmed my friend’s reaction. The beef was not the usual dried out ground beef but instead small pieces of beef that exuded its moist meatiness, complemented by pieces of olive, tomato and raisin that lent their sweet, fruity, and salty notes to this mix that rounded off the palette of multi-flavors. Also, what amazed me was the a small of pool of savory juice encapsulated by the fried dough which stumped me for a few minutes. Then I figured out that they used the same technique of refrigerating the stuffing into a gelatinous mix before stuffing and frying the packets, much like what I noticed in the making of Xiao Long Bao or Soup Dumpling (see blog and photo). 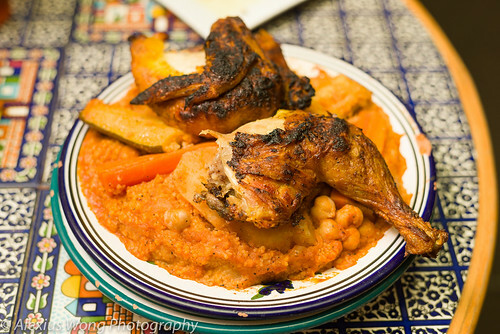 Another day’s order was the same dish but made with chicken – Empanada Tucumama de Pollo. 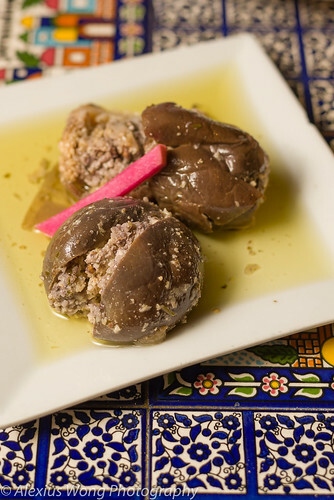 These bites were equally tasty with the chicken filling made savory with the sweet from onions, vegetal notes from green peppers, and the richness from boiled eggs. To round off these orders, I tasted the spinach version in one of the visits, and I found it greaseless (from baking, unlike the above) and tasting fresh with the use of slightly bitter but fresh whole greens. At the same meal, I had to try their version of Tortilla Española. I ordered the simple potato type but it came with strands of green and red pepper weaving through the egg-potato mixture. Although this rendition was a surprise and non-traditional approach from the Continental version, I enjoyed every bite of it. 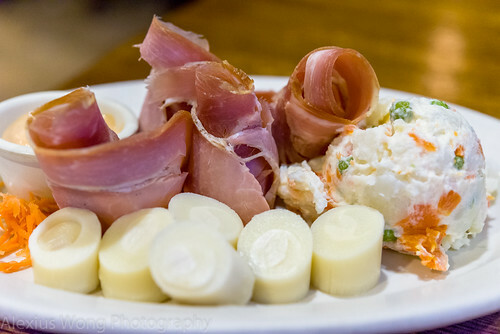 Another appetizer that caught my attention was Prosciuto Ham with Hearts of Palm. This cold cut dish makes a nod to the large influx of Italian immigrants to this South American nation, and the starch to the country’s semi-tropical climate. The rolls of ham were drier and thicker than the paper-thin imported slices. But once I got used to the textural difference, I began to appreciate its flavors which were a bit salty, mildy “porky”, faintly barn-like (a good thing here) and a hint of vinegar that cut through its rich qualities. The hearts of palm were the perfect counterfoil to the meaty bites with their mild and slightly vinegary softness. 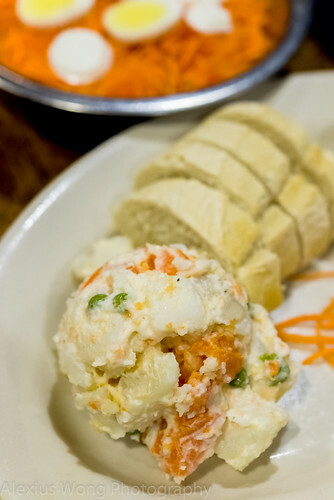 The side of potato salad (Ensalada Rusa – a typical Spanish side) was merely “meh” since it was rather bland and the pieces of carrots and peas uninspiring. But I would ignore this boring partner on the plate and focus on its tasty friends. The order is a generous portion to be shared with another diner. On one occasion I was in the mood for one of the two soup offerings in the house – Locro Soup. Despite my waiter’s preference for his wife’s version, I still went ahead with the order. What arrived was a large bowlful of deliciousness. 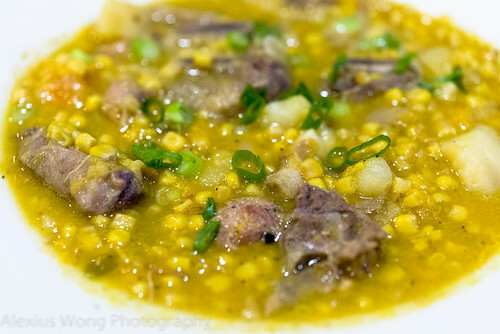 Bits of beef, pork, and sausage flavored a broth studded with fresh corn, potato, and greens. With each bite, I was enjoying its mild and subtle flavors along with a sense of comfort that each spoonful exuded. The pieces of meat were soft and still retained flavor, the corn slightly sweet, and pieces of potato gave the bowl some body. I would say that this is probably the Argentinian chicken soup for a rainy or poor health day. 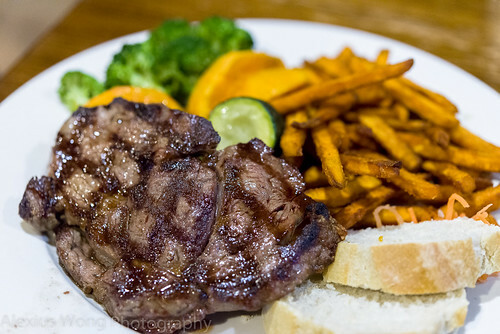 Argentinian cuisine, like its neighbor’s, Brazil, is renown for meat dishes especially grilled meats. My dining partner, who spent his early formative years in Buenos Aires, and I went for the Parrillada Para Dos. The large caste-iron plate arrived with a huge mound of grilled cuts of meats. Initially, I was overwhelmed by such sight since meat is never the “main” in my meals. I slowly picked my way through the meal by judiciously tasting small portions. 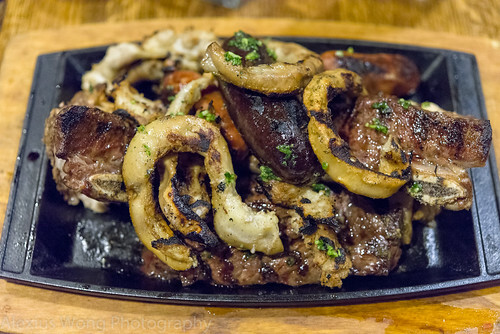 At the end, I found some favorites that I enjoyed: Morcilla (blood sausage, harkening back to my Spanish college days) was savory with its slight mineral and dark-spice qualities, Tira de Asado (beef short ribs) was meaty, moist and smokey, as well as the usual cuts of chicken and flank steak. Some cuts that I wasn’t particularly fond of: Molleja (beef sweetbreads) which was surprisingly chewy and with its organ bitterness, and Chinchulines (intestines) which had the same texture and after-notes as with the sweetbreads. The side Chimichurri sauce (regular and spicy versions) were properly made and it imparted its vinegary and onion qualities to each bite along with fragrant notes from oregano and parsley. The side of carrot salad topped with slices boiled egg was nothing than just its raw elements. However, a dousing of vinegar and salad oil made it more palatable. Again, the potato salad was “meh” per the previous paragraph. For a higher price, there is the Parrillada Buenos Aires in which better cuts of meat are served. Note of caution: these orders are meant for at least 2, but I would say 3 is just fine. Another grilled meat order by my companion was Grilled Ribeye Steak. My friend’s preference for its cooking temperature was medium-well, which is overcooked in my mind. But a taste of the meat revealed something quite surprising. The meat was cooked at the right temperature, judging by the lack of redness, yet it retained a level of moisture that made it palatable. But what grabbed my attention was the aged flavor that came with each bite, pointing to a good piece of beef cooked perfectly on the searing grill. The sweet potato fries were properly fried and greaseless, tasting freshly cut and naturally sweet. The steamed mixed vegetables were perfectly cooked, not tasting raw but remaining slightly firm to the bite and allowing their natural flavors to shine through. Such well-executed vegetables only point to attentive and skilled hands in the kitchen. An order of T-bone Steak by another friend was equally impressive with the meat served at its proper medium temperature. Steaks are a must order in this house. In addition to the steak dishes, we decided to give some non-beef dishes a taste. 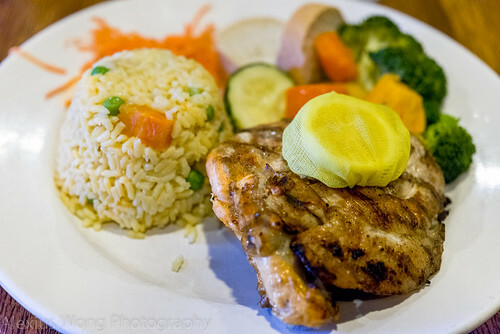 Grilled Chicken Breast was my friend’s order for lunch one day. Again, I was impressed by another grilled dish with the poultry tasting well-seasoned and smokey while retaining moisture, especially for breast meat. My companion was very satisfied with his dish, and rightfully so. My lunch consisted of the Grilled Fish. The fillet was well grilled and still moist from the dry heat. However, I found it to be a bit too salty in certain parts, and the mud-like flavor inherent in Tilapia was a bit overwhelming. 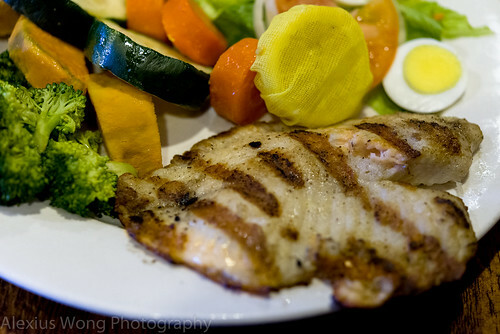 The saving graces were the amazing steamed vegetables and a proper salad that made up for the seafood’s shortcomings. 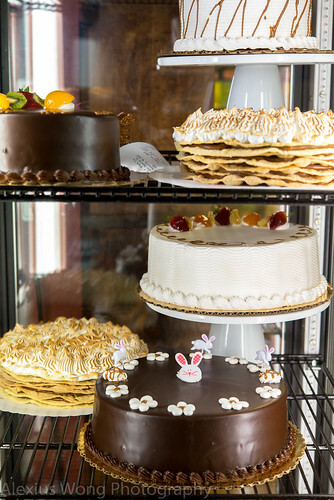 Besides empanadas and grilled proteins, this cuisine is also renown for desserts, and the display counter and tower not only tempt you with the sweet offerings but also serve as a reminder for the diner to save room for a sweet ending. Alforja was one of the orders. 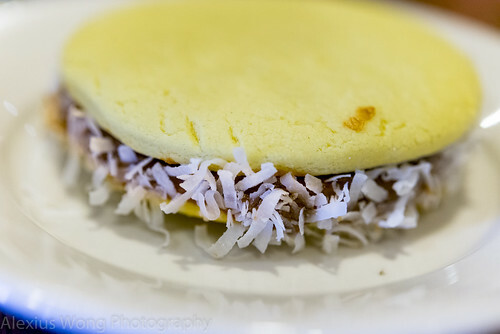 A huge cookie sandwich arrived comprising of two discs stuck together by caramelized condensed milk with bits of dried coconut shaving. I initially found the cookies a bit too dry and overwhelming, but after removing one of them, I started to enjoy the other elements with the better balanced mix. Another order was Quince Tart. I found the dough flaky but a tad too thick for my taste. The topping was not too sweet but fruity, reminding me of English fruit tarts – the British influence is present in Argentinian culture, and this dessert is a nod to the Continent. The last order was Torta Tres Leches. 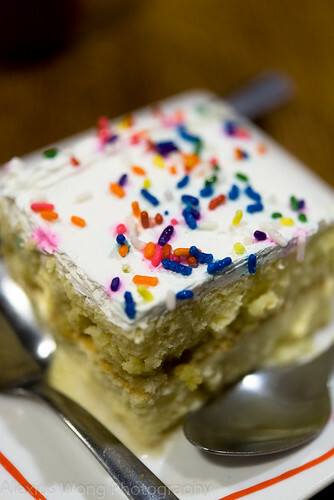 The cake was moist and rich from a soaking of slightly sweet combination of milk and condensed milk, topped with some whipping cream and colorful sprinkles. Even though we were stuffed from our meal, we were relishing every morsel with its rich and light qualities beckoning us to take another bite. No surprise it is the house’s top selling dessert. El Patio is not a fancy restaurant and it does not purport to be one either. But what dishes they serve, some are well-executed and very tasty, from the incredible Empanadas that are the perfect main-openers (or an assortment as my main course), to the Parrillada with some tasty (and not so favorable) cuts of meat, to the perfectly aged and grilled steaks and chicken accompanied by perfectly steamed vegetables, and to the assortment of tempting desserts. Judging by the low dish and wine prices, this establishment is not out to make a huge profit, but one that is committed to serve good home-style cooking for the expat and the locals. The amiable and charming service gives an impression that everyone is welcome to just kick back and enjoy Argentine cuisine. I definitely will be back for more of their wonderful offerings in this unassuming diner. 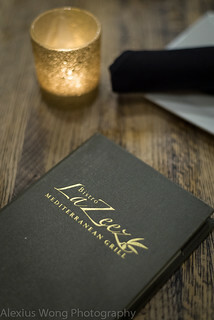 Just a quick post on a dinner visit to Bistro LaZeez in Bethesda, MD. Not enough for a blog but just a post with a couple of highlights. 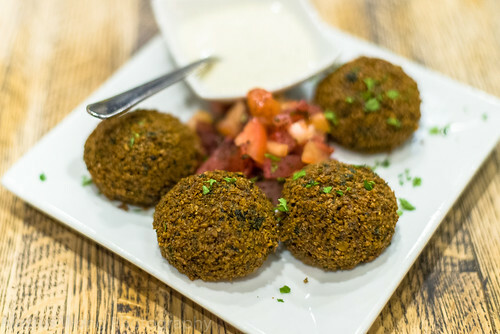 The Falafels’ crunchy exterior held a moist and dark-spiced flavorful interior. The lemony tahini sauce was the perfect companion to these delicious bites. 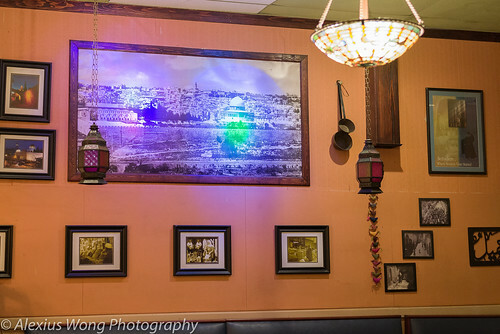 Two couples next to us also ordered the same appetizer, as well as Kibbeh (like falafel but with spiced meat), which they also enjoyed. 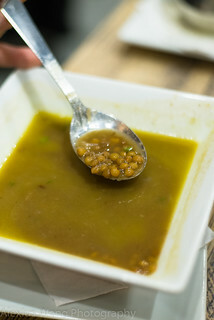 The Lentil Soup was not as thick as one usually finds, but it was full of flavor. 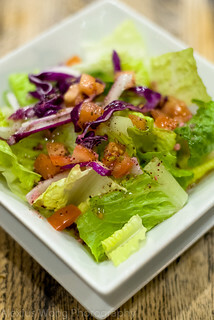 House Salad was your usual salad with a bit of Sumac and citrusy lemon olive oil vinaigrette. 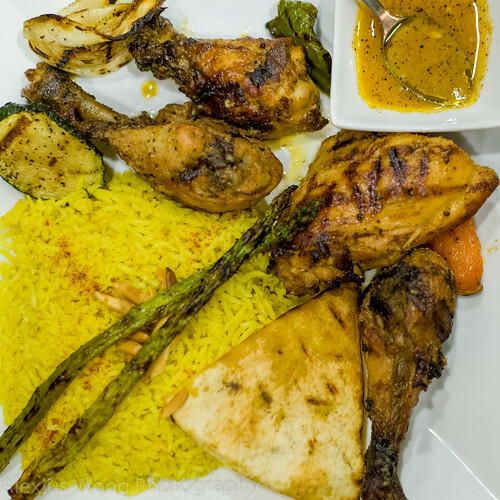 Chicken Medley – the pieces of poultry were marinated in a tangy garlic sauce that added a zing and flavor, but the dark meat was cooked too long, hence the rather dry and tough pieces, even for these cuts of meat. However, I enjoyed the heavily scented yellow turmeric rice with almonds, along with the grilled vegetables. 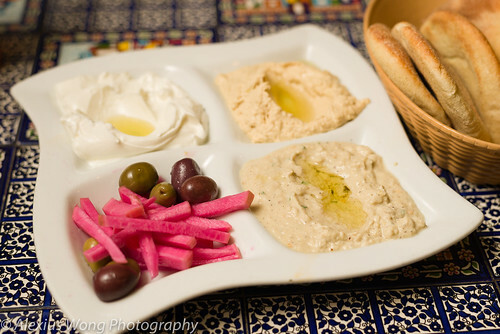 The sumac-laced baked pita bread added some textural and flavor contrast to the dish. The Grilled Cornish Hen tasted of the same marinade as the above chicken which was a bit too tart for my dining companion, and he mistakenly poured the marinade over the pieces before trying them, adding to his woes. The pieces of poultry suffered the same fate as the above dish for they were overcooked – a casualty of being double-cooked (precooked first) and not grilled from scratch. Usually one to take home leftovers, his was not packed-up this time. The couples next to us confirmed that their chicken was equally dry.